At the heart of the Catholic experience is the liturgy. Through the expression of the retelling of Christ's life and passion, all of us are drawn to this wonderful celebration. 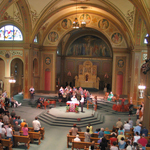 Since Vatican II, the liturgy has gone beyond the Sanctuary to the pews, involving everyone, from priest to parishioner, from musician to usher. At St. Francis of Assisi, with its magnificent building, artistic resources and thriving community, we hold this mandate to heart. From very traditional celebrations with the St. Francis Choir to a contemporary liturgy with piano and guitar. Join us today and experience the joy of the life of Christ Jesus, like never before. We've listed all the times and locations of our Daily and Weekend services. A thorough definition of the Catholic liturgical year. Learn about opportunities to become active in Liturgical Ministry.